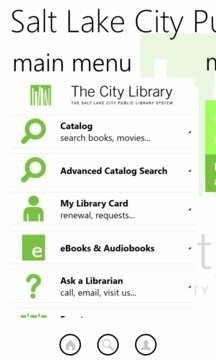 Now you have access to the Salt Lake City Public Library, right on the home screen of your mobile device! Manage your account, place holds, renew items, and view your fines. Access the Library’s eBook and downloadable Audiobook collections directly within the SLCPL app! The 3M Cloud Library, OverDrive, and OneClickdigital external apps are integrated right within The City Library app, delivering access to all three within a single app. Find a Book or CD you want on Amazon.com, in Barnes & Noble, or any other store? 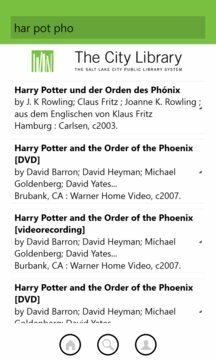 Before you buy, check to see if it’s available for checkout in The City Library catalog with BookLook™! Simply scan the item’s ISBN Barcode with your phone’s camera to see if the item is available from the Library. Camera not working? You can enter ISBNs manually. Allows direct connection to reference services via email or phone. Now the Library’s calendar of events is with you wherever you go. Stay up-to-date with happenings at the Library! Connect with us on your favorite social networks and be on the lookout for posts featuring exciting event notices, pertinent news, interesting links, and recommended readings. GPS-aware technology allows mappable turn-by-turn directions to each branch address. Also includes hours of operation and click-to-call contact information for each branch. To checkout books or view your account, you will need to get an account from your library serviced by this application.